Sweet Chili Roasted Pumpkin Seeds are one of the many ways to eat pumpkin seeds. There are so many flavour of pumpkin seeds. The most common one in the store is the plain salted roasted pumpkin seeds, but it’s so easy to make so many cool flavours. Pumpkin Seeds are very healthy for you, providing dietary fiber, niacin, iron, zinc, manganese, magnesium and more. They’re also a source of Omega-3. Eating only a handful will provide a great boost of zinc and magnesium, which is kind of their claim to fame. 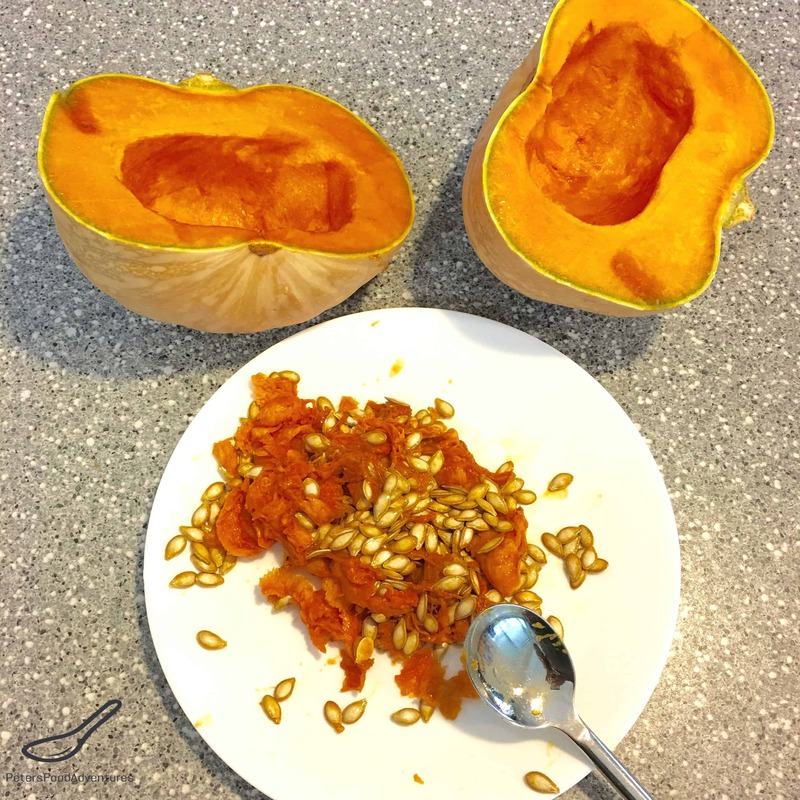 They are also called Pepitas (pepita de calabaza), which is Spanish for ‘little squash seeds’ which are interchangeable with pumpkin seeds. I remember fondly as a child, making our homemade pumpkin seeds, using our wood burning stove. In the autumn, during harvest time, it was cold enough to start the fireplace to heat the house. Mum would put the seeds on a baking sheet and place it on top of the fireplace to roast. We’d then eat them, except as a kid, I usually ate the entire seed. It seems that flavoured pumpkin seeds aren’t readily available here in Australia, so it’s been great to make my own. I love spicy foods, so my homemade Sweet Chili Sauce worked perfectly or it’s available in any grocery store. Some people use Honey and Chili flakes, or even oil mixed with various spices to flavour pumpkin seeds. So many flavour combinations possible. Most people need to use up pumpkin seeds because they are leftover from a recipe they are making. If you are buying a pumpkin just for the seeds, here are some pumpkin recipe ideas your leftover pumpkin. My favorite pumpkin recipes are Sweet Pumpkin Pie, Pumpkin Soup, and the family favorite, Pumpkin Roll with Cream Cheese. All definitely worth making! 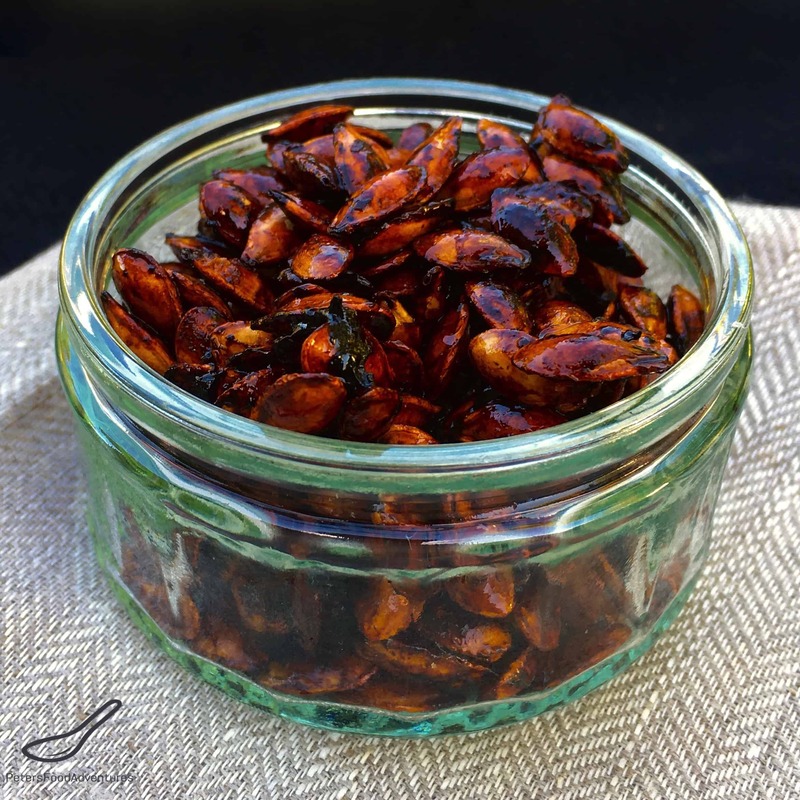 So the next time you buy a pumpkin, don’t throw the seeds out, try this Sweet Chili Roasted Pumpkin Seeds recipe instead. Bon Appetit! Приятного аппетита! Carefully deseed the pumpkin. Pull apart the flesh from the seeds and put the seeds into a colander. Wash the seeds until they are clean. Drain. Dry the seeds using a paper towel, or allow time to dry out. 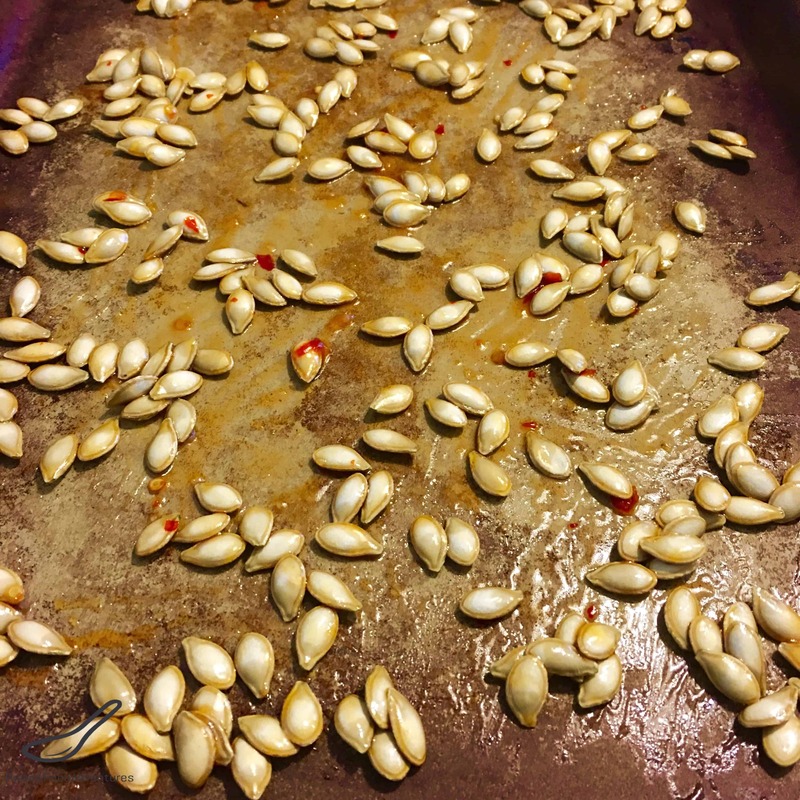 Place the pumpkin seeds on a baking sheet. Add the olive oil and Sweet Chilli Sauce and mix it together until full coated. Spread the pumpkin seeds evenly across the baking sheet. Bake for 20-30 minutes, mixing every 10 minutes during the baking process. Bake until golden brown. There is a fine line between deep golden brown and burnt, due to the sugar content, be careful not to burn. 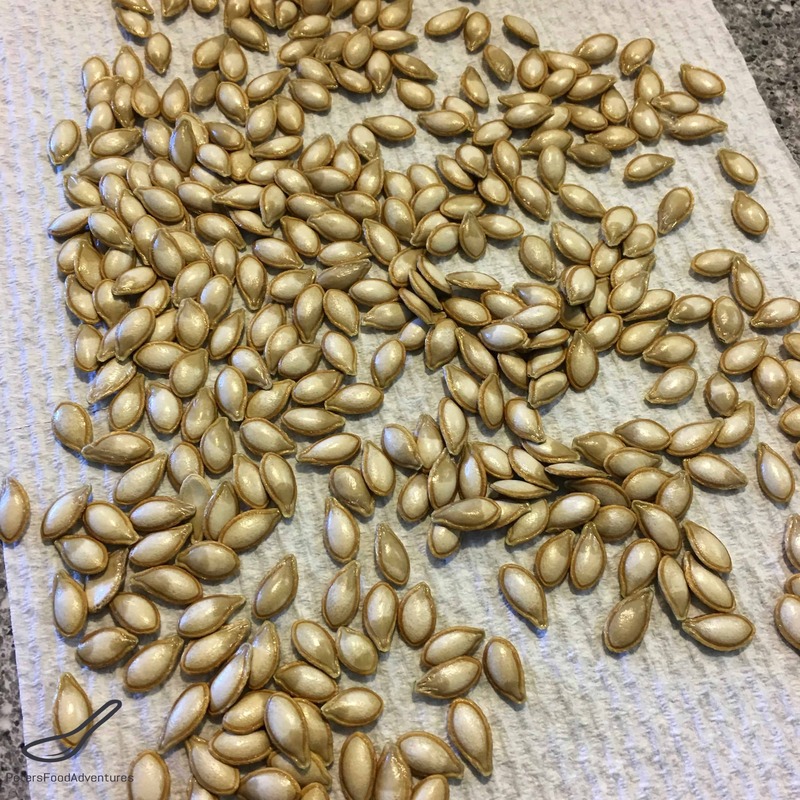 If you're concerned about the sugars from the Sweet Chili sauce burning, roast the pumpkin seeds without the sauce for about 15 minutes. Then toss through the sauce and continue to roast until done.